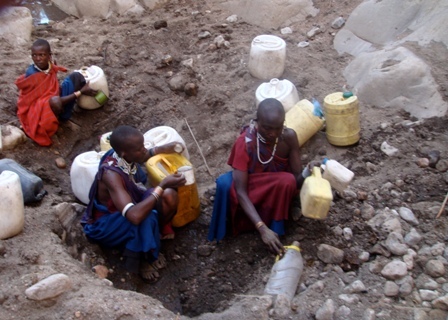 Maasai ladies collecting dirty water from a dry riverbed one cup at a time. Aid Tanzania has partnered with Safe Water Now to distribute ceramic water filters to the residents of Ngorongoro Conservation Area. Each filter donated by Aid Tanzania's and Safe Water Now's supporters provides drinking water to a family of 6 for five years. There are now 750 more people in the world with access to safe clean drinking water. You can see the google map image of this remote area here. KRO also facilitated 5 Sawyer filters donated by Babson College students at Nooseya (Oloirobi) Primary School.